Jack-in-the-Pulpits (Arisaema triphyllum) are such unusual looking plants, but you can’t help but love the way they stand so erect, hiding the jack inside. Jacks are that special shade garden specimen because of their unusual appearance. 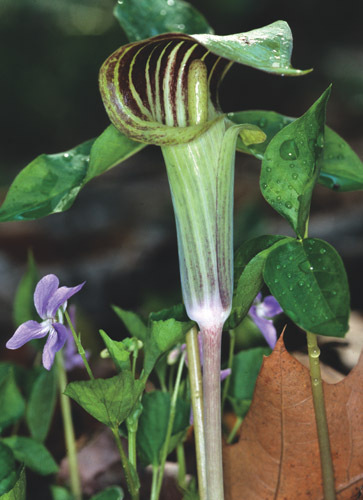 Its flower looks like a “Jack” in a pulpit. They can grow anywhere from 1 to 3 feet tall. Typically, the older they are and the richer the soil, the larger the plant. They like rich, damp soil. Some tolerate even wetter areas like bogs and stream banks. This native grows in the eastern half of the United States. Jack-in-the-Pulpit (Arisaema triphyllum) plants are one of the most unique plants in America’s moist forests and wetland areas. If you use your imagination, you can see the preacher (Jack) inside his pulpit. 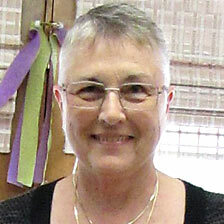 Photo courtesy of Wildflower Weekly. 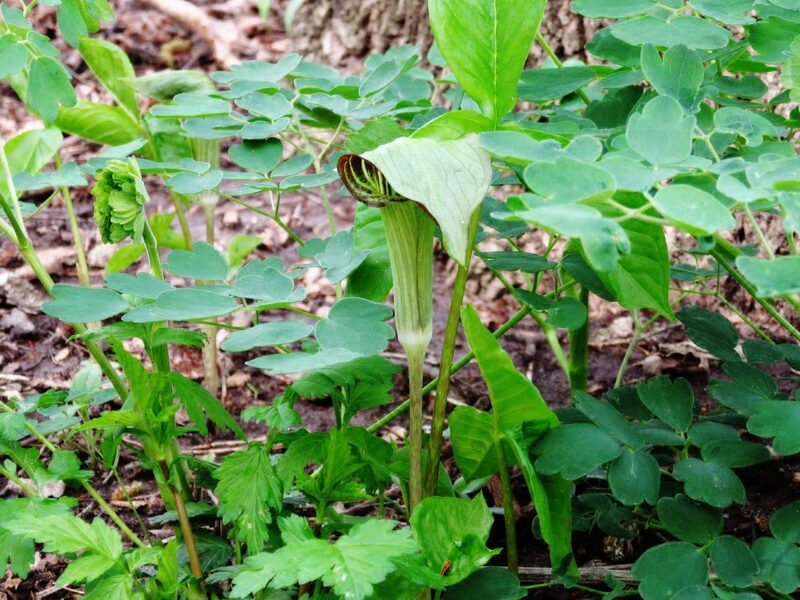 The green flower, called a spathe, is shaped like a hooded pulpit. It often has green or maroon strips for added color. The spathe gently folds over the “Jack” which is a stout column inside called a spadix. This column has a rounded top and is covered with many tiny flowers. Although there are male and female Jacks (dioecious), their spadix is covered with tiny flowers containing both male and female parts. It is pollinated by fungus gnats (flies) who are attracted to a slight fungal odor given off by the spath. The gnats are looking for a place to lay their eggs. In so doing they provide the pollination needed for the Jack-in-the-Pulpits to propagate. The tricky part is navigating between the male and females Jacks. The male Jacks provide an escape route for the gnats, but the females do not. Often you’ll find a number of young Jacks growing together in a group where the seeds fall. The plant’s two large leaves, each with three leaflets, are often confused with Trillium leaves. Trillium (Trillium grandiflorum) leaves, however, are broader and the vein pattern is different. After pollination, the tiny flowers on the spadix wither and eventually turn into the prettiest bright red berries. The berries, as they ripen, turn into mush containing up to five seeds. 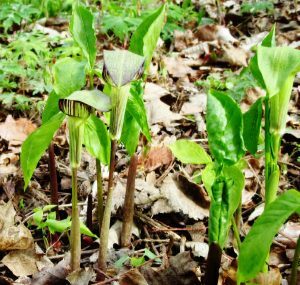 So although the Jack-in-the-Pulpit plant is a corm (bulb) which sends out shoots to produce new plants, it also grows from a seed. It requires cold-stratification to germinate. See How to Germinate Native Seeds by Prairie Moon Nursery for more details on cold-stratification. 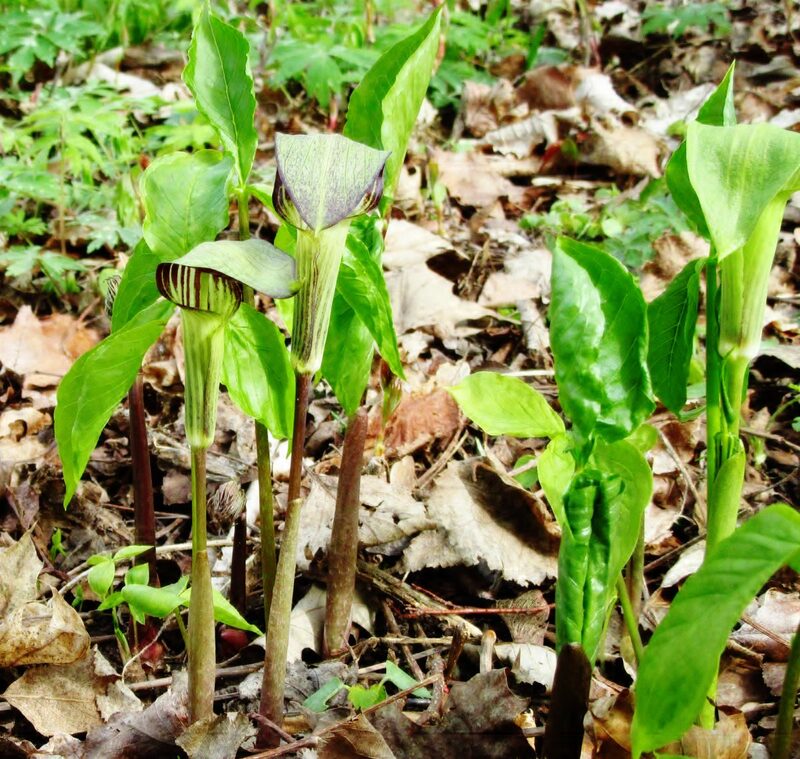 In my research, I found very little about animals that eat the seeds of the Jack-in-the-Pulpit, although I did see reference to birds and turkeys. It seems the juice of the berry is irritating and the berries themselves are poisonous and also irritating — perhaps this defense is the reason why so few critters munch on it. I do know, however, in my own woodland, I rarely get to see the seeds ripen completely because they are eaten by something.